Summit1g made his name as a Counter-Strike pro, and since he became a full-time streamer much of his time has been spent with competitive shooters. But last year, he switched to streaming Sea of Thieves, and the new genre of pirate sandbox seems to be working out all right. Summit1g now has more subscribers than anyone else on Twitch. He passed prolific Fortnite streamer Ninja for the title just yesterday, according to Twitch Stats. Summit1g now has 42,953 subscribers according to the site’s tabulations, just above Ninja’s 41,938. Do take note that this stat only applies to paid Twitch subscriptions, as Summit1g has a lot of ground to make up elsewhere. He’s got 3,846,523 followers, which ranks him fifth by follower count – Ninja’s still on top of that metric with over 13 million follows. “Somehow breaking personal records on the daily, thanks again for the support dudes,” Summit1g tweeted yesterday. 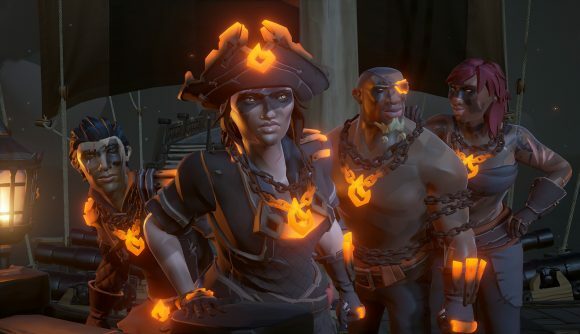 “Insane.” His streams have brought a bunch of new players to the game, but that’s left the game’s existing community debating whether Summit1g has been griefing Sea of Thieves or just playing as a pirate should. Sea of Thieves was one of our GOTY 2018 picks – mine, specifically – and the bit of symbiotic success here is lovely to see. Updates like Shrouded Spoils have kept the game fresh after an admittedly rocky launch. Just watch out if you see Summit1g sailing toward you – I hear he’s one of the most feared names on the seas.